On Friday, March 18th, Pacific Ridge welcomed the official start of spring a few days early at the second annual Spring Kickoff event. 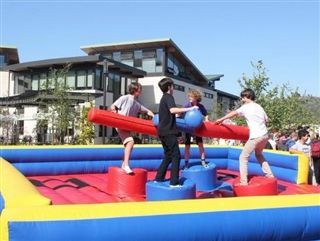 Students stuck around long after the school day ended to enjoy hamburgers and hot dogs, compete against friends in the inflatable jousting ring or on the inflatable obstacle course, laugh along with the Improv Team, and socialize in the sunshine. The event, hosted by Upper and Middle School Student Council, was the perfect way to celebrate warmer weather, longer days, and the countdown to exciting events including Spring Break, Global Travel, and Commencement.